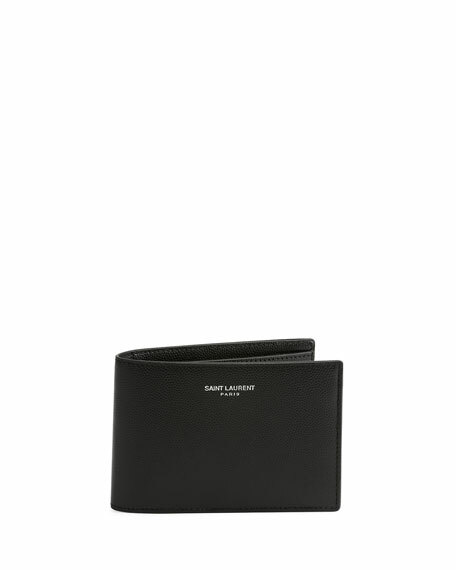 Saint Laurent classic bi-fold wallet in calf leather. Interior, currency compartment, multiple slip pockets. For in-store inquiries, use sku #1652746. 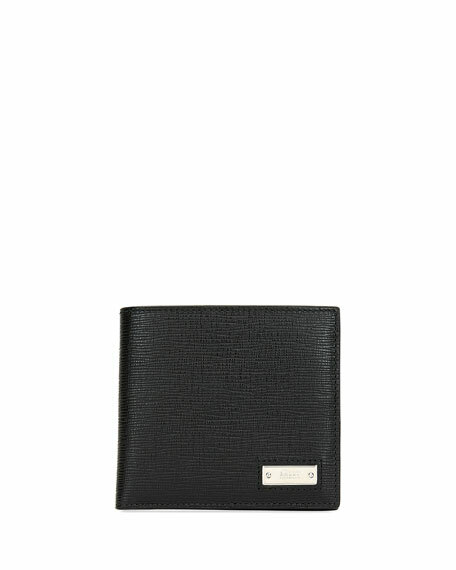 Balenciaga metallic calf leather wallet. Zip-around top closure. Logo at center front. Bi-fold construction with snap closure. Interior, one bill and eight card slots. Made in Italy. 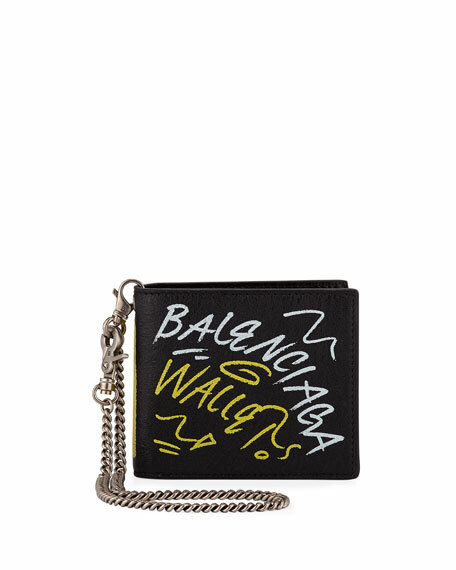 Balenciaga bi-fold wallet with marker-stroke graffiti print of "wallet!" arrow on front, "bazar!" inside, and "75007 Paris" on back. Four card slots; one bill compartment. Flap-top coin pocket. Lambskin leather. "Explorer" is made in Italy. 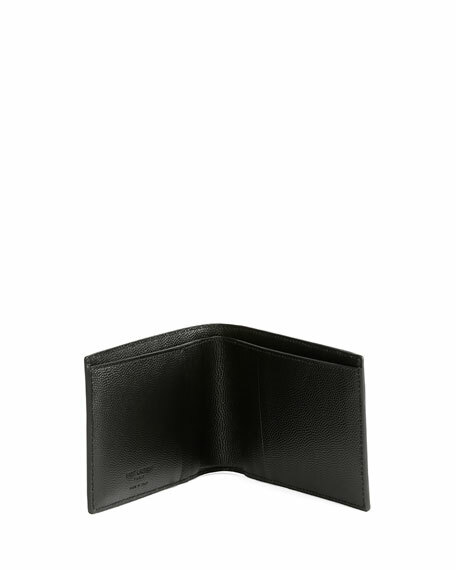 Bally "Trasai" wallet in grained leather. Iconic Trainspotting striped appliqu down center front. Two bill compartments, eight card slots, two receipt pockets. 3.9"H x 4.3"W. Imported. 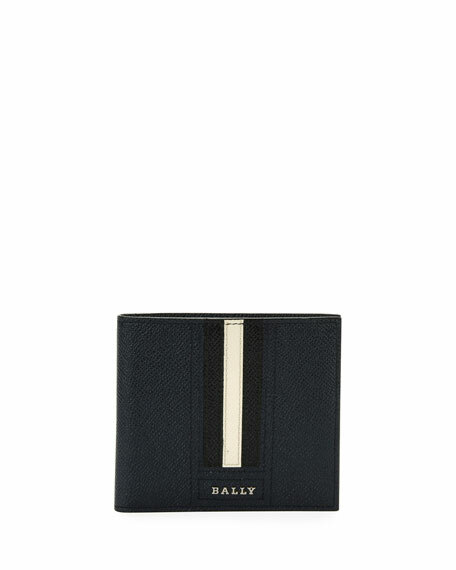 Bally wallet in textured leather with logo plaque detail. Palladium-toned hardware. Two bill compartment, four card slots, one change pocket. "Beisel" is imported.